Camp Lemonnier is a United States Naval Expeditionary Base, situated next to Djibouti–Ambouli International Airport in Djibouti City, and home to the Combined Joint Task Force – Horn of Africa (CJTF-HOA) of the U.S. Africa Command (USAFRICOM). It is the only permanent U.S. military base in Africa. The camp is operated by U.S. Navy Region Europe, Africa, Southwest Asia; CJTF-HOA is the most notable tenant command located at the facility as of 2008. A sign bearing the Camp Lemonnier patch. Camp Lemonnier was originally established as garrison for the French Foreign Legion. The base was leased by Djibouti to the United States in 2001, along with the right to use the neighboring airport and port facilities. The base supports Operation Enduring Freedom – Horn of Africa (OEF-HOA) and is the centerpiece of a network of around six U.S. drone and surveillance bases stretching across the continent. The latter air bases are smaller and operate from remote hangars situated within local military bases or civilian airports. Due to its strategic location, Camp Lemonnier also serves as a hub for aerial operations in the Persian Gulf region. Djibouti is strategically located by the Bab-el-Mandeb Strait, which separates the Gulf of Aden from the Red Sea and controls the approaches to the Suez Canal. As a result, the country hosts many other foreign military bases, including a Chinese naval base, a French airbase, and a Japanese base. To protect against security threats, Camp Lemonnier is operated like an aircraft carrier. Unlike French troops, who are allowed to enter the city and interact with the local population, US troops are not allowed to leave Camp Lemonnier except by special permission, and most of Djibouti City is classified as a "no-go area". Camp Lemonnier is located in the town of Ambouli on the southern side of the Djibouti–Ambouli International Airport, between the runway overflow areas and a French military munitions storage facility. After use by the French Foreign Legion, the facility was operated by the Djibouti Armed Forces. Following the September 11, 2001 attacks, the U.S. decided to start anti-terrorism efforts. At first, this was limited to focused attacks, but in 2002 the U.S. government realized that to reduce extremism would require long term engagement with the local governments and populations. As a result, it established the Combined Joint Task Force-Horn of Africa to conduct stability operations in the area. In November 2002, the CJTF-HOA staff, a Marine-based organization, arrived off the coast of Djibouti aboard USS Mount Whitney, a naval command ship. 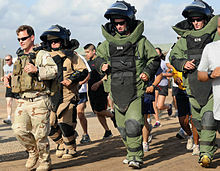 CJTF-HOA soldiers taking part in the 2011 Explosive Ordnance Disposal 5-K Run at Camp Lemonnier. While the intent was to move ashore, the Camp Lemonnier facilities which had not been in use for several years were in a state of disrepair. Some buildings were concrete shells and had been stripped of interior fixtures, pipes and wiring, while the roofs of several structures had collapsed. Goats roamed the property and birds had taken roost in several of the abandoned structures. The former swimming pool had been used as a trash dump and was a borderline hazardous material site. Some buildings that were closer to the Djiboutian Air Force controlled side of the airport were in better shape and required minimal renovation. As a result, the CJTF-HOA staff remained aboard the USS Mount Whitney as the U.S. Army (Bravo Company, 46th Engineer Battalion (CBT)(HVY)) began renovations. (Camp Physical Security was first established by Marines from 2D Fleet Anti-Terrorism Security Team (FAST Co) and was handed over to the 551st Military Police Company, 101st Airborne Division) This involved building new concrete pads, maintenance facilities and living areas. In May 2003, Camp Lemonnier was livable and CJTF-HOA transitioned from the Mount Whitney to the camp. The pool was cleaned, refurbished, and opened in spring of 2003. In January 2007, it was announced Camp Lemonnier would be expanded from 97 acres (0.39 km2) to nearly 500 acres (2.0 km2). As part of the process of moving Lemonnier from an "expeditionary" base to a long term facility, the camp built a living area, known as "CLUville". CLUville consists of long rows of Containerized Living Units (CLUs) with concrete sidewalks and gravel roads. As CLUville expanded, the camp population moved from tents into the more durable berthing facilities. Lemonnier originally belonged to the French military, and was named after General Emile-René Lemonnier. In 2009, after years of misspelling, the U.S. Navy officially changed the camp's name to properly reflect the spelling of General Lemonnier's name. As of May 2013, the US had prepared plans for a $1.4 billion expansion of the base and to increase its special forces there to more than 1,000. In May 2014, Presidents Obama and Guelleh agreed on a 20-year extension of the American lease, at $70 million a year in rent – about double what it was paying before. The US is in the process of expanding the base and plans to spend $1.4 billion upgrading the facility over the next two decades. In 2017, China opened a base nearby. From that military base laser beams originated, injuring the eyes of American Air Force pilots. China denied that they were the cause of the lasers. Combined Joint Task Force-Horn of Africa (CJTF-HOA) began moving all headquarters personnel and equipment from its flagship, USS Mount Whitney, in the Gulf of Aden, into facilities at Camp Lemonnier on 6 May 2003. Djiboutian workers were instrumental in preparing the newly renovated 88-acre (360,000 m2) camp for movement of the CJTF headquarters ashore. More than 1,200 local and third-country national construction and support personnel currently work at the camp. KBR administers the contract for facilities and support operations for the camp. On 1 July 2006, the U.S. Marine Corps turned over responsibility for Camp Lemonnier to the U.S. Navy in a brief change of command ceremony. U.S. Navy Captain Robert Fahey assumed command of Camp Lemonnier from U.S. Marine Corps Colonel Gerard Fischer. In early July 2006, the U.S. and Djiboutian governments also announced that a lease agreement had been signed to expand Camp Lemonnier from 88 acres (360,000 m2) to nearly 500 acres (2 km²). The term of the lease was for five years, with options to renew. As part of the lease and expansion, physical improvements to the camp included fencing, additional billeting to replace existing tents, and compliance with various U.S. force protection standoff requirements. By 2009, the base began expansion again. According to OSGEOINT, the base received a parallel taxi-way and a new auxiliary support apron. In the following year (2011), open source satellite imagery showed Camp Lemmonier with a new drone apron supporting the RQ/MQ-1 Predator. Furthermore, Camp Lemmonier has been described by The Economist as "the most important base for drone operations outside the war zone of Afghanistan", with drones conducting missions in adjacent Yemen and Somalia. Camp Lemonnier became the hub for black and white SOF operations into nations such as Somalia and Yemen. Also based there is the SOCCE-HOA (Special Operations Command and Control Element-Horn of Africa) – which commands all SOCOM units assigned to training or operational missions in the region including elements of JSOTF-TS (Joint Special Operations Task Force-Trans Sahara) and Naval Special Warfare Unit 10. It also coordinates a rotational detachment of US Army Special Forces which conducts foreign Internal Defence training in counterinsurgency in both Djibouti and in countries such as Mali. In a separate secure compound within the base there are an estimated 300 JSOC personnel: special operators, intelligence and imagery analysts and a dedicated UAV cell. The UAV cell is commanded by a JSOC Major and tasks a flight of 8 MQ-1 Predators conducting operations over Somalia, Mali and Yemen, the Predators have been carrying out strikes and surveillance missions from Camp Lemonnier since late 2010. Prior to that, both CIA and JSOC had used the base as a temporary forward location for Predator and Reaper sorties into the region. In October 2011, a squadron of USAF F-15E was deployed to the base and have flown numerous combat missions into Yemen in support of both Yemeni government forces and unilateral strikes directed by JSOC and the CIA targeting cells. Along with the UAV's and F-15E's, surveillance flights are conducted by Air Force Special Operations Command U-28As, that are outfitted with sophisticated signals intercept equipment and optical sensors, which can provide real-time intelligence for ground operators. In 2013, the UAV's operating out of the base were moved to Chabelley Airport – which increased operational security and allayed local fears after a UAV and its Hellfire missile crashed in a Djibouti suburb. On 1 October 2008, responsibility for the task force was transferred from the United States Central Command (USCENTCOM) to United States Africa Command (USAFRICOM) as the latter assumed authority over the African theater of operations. Camp Lemonnier is operated by Commander, Navy Region Europe, Africa, Southwest Asia, which is responsible for its expansion, upkeep, and logistics support. Tenant units include the U.S. Marine Security Forces which provides the camp's external security, the CJTF-HOA commander and staff, a U.S. Navy Seabee battalion which conducts water-well drilling operations, U.S. Army units which provide additional security, military training, and Civil-military operations support, and several aircraft detachments. Past tenant units have included the U.S. Marine 9th Provisional Security Force; 2nd Battalion, 18th Field Artillery Regiment; and 1–65th Infantry Regiment, A Company, 1-16 Infantry, 1st Infantry division out of Kansas was there 2006–2007, Puerto Rico Army National Guard as well as the USAF's First Red Horse Group. 2nd 137th CAB from Kansas, had duties in Force Protection. While the 2-137 IN was there, the unit received a MUC for duties. The dates of deployment was from June 2010 to April 2011. The 3-124 CAV (R&S), a Texas Army National Guard unit, provided force protection for Camp Lemonnier and other support for the CJTF-HOA until being relieved by the 2-138th FAR from the Kentucky Army National Guard. The 449th Air Expeditionary Group is U.S. Air Force component to CJTF-HOA and is assigned to Camp Lemonnier. The 449th AEG is currently composed of HC-130P Hercules aircraft assigned to the 81st Expeditionary Rescue Squadron and pararescuemen assigned to the 82nd Expeditionary Rescue Squadron. While deployed the group performed both combat and civil search and rescue missions. Aircraft detachments include a U.S. Marine heavy-lift helicopter (CH-53) detachment, a U.S. Marine assault-support MV-22 Osprey detachment, a U.S. Navy P-3 detachment (technically a part of the US Navy's 6th Fleet – Commander Task Force 67), USAF aircraft include HC-130P Hercules, and, at times, a C-17 Globemaster III detachment. ^ "Commanding Officer". Camp Lemonnier. United States Navy. Archived from the original on 8 March 2013. Retrieved 2 May 2013. ^ "Introduction to MARCENT". United States Marine Corps. May 2006. Archived from the original (PPT) on 25 October 2007. Retrieved 9 February 2007. ^ a b "Africans Fear Hidden U.S. Agenda in New Approach to Africom". Associated Press. 30 September 2008. Archived from the original on 2 April 2013. Retrieved 30 September 2008. ^ Contorno, Steve (12 June 2014). "Hillary Clinton says in memoir that there's very little U.S. military presence in Africa". PolitiFact.com. Retrieved 3 July 2014. ^ a b c "U.S. expands secret intelligence operations in Africa". Washington Post. 13 June 2012. Retrieved 5 April 2015. ^ "Remote U.S. base at core of secret operations". Washington Post. 26 October 2012. Retrieved 5 April 2015. ^ Jacobs, Andrew; Perlez, Jane (25 February 2017). "U.S. Wary of Its New Neighbor in Djibouti: A Chinese Naval Base". ^ Pieper, Dietmar (8 February 2018). "Geopolitical Laboratory: How Djibouti Became China's Gateway To Africa". Spiegel Online. ^ "Camp Lemonier, Djibouti, expands both in size and job opportunities". CJTF-HOA. 23 January 2007. Archived from the original on 2 July 2007. Retrieved 7 February 2007. ^ "Somalia: Western hostages freed in US military raid". BBC News. 25 January 2012. Retrieved 25 January 2012. Two foreign aid workers kidnapped in Somalia three months ago have been freed in a rare US military raid. ^ "Djibouti, a safe harbour in the troubled Horn of Africa". www.thenational.ae. 15 October 2015. ^ Shearer, Andrew (9 May 2018). "How China's Laser Attacks on the U.S. Military Could Cause a Serious Conflict". Fortune. Retrieved 9 May 2018. ^ Oprea, Megan G. (8 May 2018). "What We Know About China's Suspected Laser Attack On U.S. Soldiers Last Week". The Federalist. Retrieved 9 May 2018. Brennan, David (3 May 2018). "Pilots Flying Over Its Base in Djibouti". Newsweek. Retrieved 9 May 2018. ^ "China denies using lasers on US aircraft in Djibouti". Washington Post. Associated Press. 4 May 2018. Retrieved 9 May 2018. ^ "Release #121: U.S. Navy Assumes Command of Camp Lemonier". United States Navy. 3 July 2006. Archived from the original on 28 November 2006. Retrieved 7 February 2007. ^ "Unmanned aerial vehicles: Death from afar". The Economist. 3 November 2012. Retrieved 30 December 2012. Wikimedia Commons has media related to Camp Lemonnier. U.S. Military plans to expand Camp Lemonier in Djibouti, Stars and Stripes, 14 August 2006. Retrieved 14 August 2006. Djibouti Is Hot How a forgotten sandlot of a country became a hub of international power games.